How easy it is to forget the similarities we share with those thousands of miles away. How easy it is to forget that the beef we eat and the milk we drink come from cows just like the ones herded through dry plains of East Africa and competing for land all across the world. A colorful cow in the middle of one of the largest cities in the world seems out of place. A cow against the grayscale city, with no pastures nearby or colorful accomplices to mediate the isolation. The cow can be no more than a fixation, meaningful only for its artistic pleasure. This is not so. The intricacies of design and conflicting colors provide insight into the contrasting significance of cattle across the world. In one place, a cow is a means for education, sold to fund a young girl’s advancement beyond her impoverished, patriarchal village. In another place, it is the protein that sustains a new mother and her child. It is also the key ingredient in social activities, furnishing Friday Fast-Food runs or Saturday game-day barbeques. The cow even plays a role in global conflicts over property, resources, and climate change. All of these uses are represented in this one fixation, represented in this one city. Our social structures extend beyond the clearly defined bounds of our immediate networks. A seemingly misplaced cow is actually as expected as the excreted waste below the animal. The herder in East Africa uses a phone to call his sibling studying in America funded through the sale of cattle. The sibling in America goes to a football game and eats a hamburger from a cow raised on a feedlot. The mother and baby live in a house near the feedlot where methane gas emissions infiltrate the air. With beauty comes waste. But, like a city, both the beauty and waste make the system unique. As with the public art in Bhutan, public art in the United States has frequently been a site for debates about values. However, the debates around public art vary significantly depending on cultural context. In a social field intensely shaped by neoliberalism, Cow Parade has been a cipher in many ways to the ethical concerns created by capitalism. Tanur's photograph of Billy the Artist's entry to the Cow Parade in New York City in 2000 symbolizes the complex intersections of art, global capitalism, and public culture. Cow Parade began as a tourist even in Zurich in 1998, soon followed by an event in Chicago in 1999 (1). Today, Cow Parade bills itself as the "largest and most successful public art event in the world" (2). Although the claim is most likely as much marketing as fact, Cow Parade holds events across the world every year. For each event, the cows are sponsored by organizations or individuals and artists, both famous and unknown, are paid to paint a prefabricated cow in a grazing, laying, or standing position. The event pits economic value against notions of public good and the idea that art ought to be more than entertainment. Cities see these events as an important way to raise revenue and tourism. A clear example of the perceived economic importance of the "creative class" (3), Cow Parade and the cities that host it attempt to use art as an economic engine. One could argue in this way Cow Parade symbolizes the hegemony of the market over art and public life. The function of the figure of the artist (4) in Cow Parade seems to be as global brand, proof of the event's cool. Tanur's image, for example, is not of an unknown artist or community project, but the globally known Billy the Artist who has in later Cow Parade projects explicitly worked with Lamborghini. In response, cultural critics in cities that host Cow Parade often have reservations about the artistic virtue and lack of history or place embodied by the event. One critic complained about the New York show that the cows are especially inappropriate for New York. The cows, for example, are Swiss rather than American and New York, unlike Zurich or Chicago, has no real historical links cows (5). Tanur's photograph also suggests local response and resistance to the pictured cow. Easy to miss at first glance against the appealing bright colors, three large cow patties muddy the otherwise neat aesthetic of the concrete and fiberglass cow. Given that the dung does not appear in Billy the Artist's image of the cow (6), perhaps we can read it as an act of resistance. The excrement could be evidence that person who placed them wanted to draw attention to how power-cultural, political, economic, or otherwise-tries to hide its mess. 3)	Florida, Richard. The Rise of the Creative Class--Revisited: Revised and Expanded. Basic Books (AZ), 2014. 4)	Foucault, Michel. "What is an Author?." Contributions in Philosophy 83 (2001): 9-22. 5)	Boxer, Sarah, "Critic's Notebook: Cattle are Standin' like Statues; Isn't it Time to Put Those Fiberglass Visitors Out to Pasture?". The New York Times (New York), July, 12, 2000. 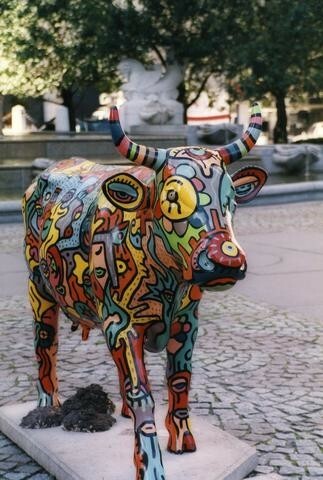 On a sunny day in 2000, Rachel Tanur photographed a brightly painted, freestanding sculpture of a cow standing on a cement base in a New York City park. The sculpture is part of cow parade, a charity initiative billed as the “world’s largest public art event.” Since 1999, Cow Parade Holdings Corporation, an American company, has enlisted 79 cities and 10,000 artists to create 5,000 cows viewed by an estimated 250 million people worldwide. The 125-pound fiberglass sculptures are mass-produced in plants in Florida and California. Artists are provided with a prototype of one of three cow forms that they decorate. Cow parades have raised over $30 million for non-profit organizations. Tanur’s photo of this life-sized, anatomically-correct cow sculpture depicts an image identical to the Holsteins’ stance in my photo within a Vermont barn. Tanur’s image and mine suggest intriguing comparisons. Like my photo, Tanur’s cow image may be obliquely commenting on how social conditions of production are appropriated and hidden. The cow parade originated in response to a public relations crisis. When Swiss banks failed to return reparation funds to Holocaust victims' families, the state decorated Zurich with cows to restore Switzerland’s pastoral alpine image. Tanur may have purposefully left people out of her composition, a possibly wry reflection of the absence of humans in idealized representations of landscape. Her image also hints at the complex realities of industrialization. The witty manure piles beneath the cow may gesture toward the grinding labor that is typically out of consumers’ consciousness. The busy patterning of the cow’s body may represent abstractions of the social, political, and economic structures that entangle within landscapes. The many eyes within the artwork may signify the vision needed to reveal invisible societal truths and ideological realities probed by visual social science methods. My personal essay asserts that we must be attentive to the positions of unseen laborers if we are to understand the landscape. This is consistent with Foucault’s (2016) construct, biopolitical sorting that elevates some people to be more worthy than others. This sorting is evident in both Tanur’s photograph and mine. Cow parade production workers and artists, just like dairy workers and farmers, are corporate vassals, subject to various techniques of control. Finally, both Tanur’s photo and mine represent different sorts of parades. In my image, Ray’s forward stride symbolizes how migrant workers disrupt the bucolic landscape through marching, rallying, and organizing other public demonstrations to “stand up for human rights.” In contrast with worker-led initiatives, the cow parade and its charity function is frozen within conventional socioeconomic structures that normalize a particular power relationship among landscape, agency, and action. Mascarenhas (2017) argues that charity, in the name of good corporate citizenship, can reproduce neoliberal forms of governance. Such voluntary efforts do not ensure fair distribution of interests, proceeds, and profits for those most in need. Thus, I contend, charity may function to obscure landscape, as it is controlled by actors whose capitalist strategies naturalize the inequitable relationships in landscape that serve their purposes. “We’re not looking for charity!” I have heard workers declare at events that advocate for binding human rights agreements with corporations. In contrast with the Vermont dairy workers, the cow parade sculptures remain in place, “on pasture,” literally and metaphorically fixed within the landscape. Foucault, M. (1985). History of Sexuality, an Introduction. Vol. 1. New York: Vintage. Mascarenhas, M. (2017). New Humanitarianism and the Crisis of Charity. Bloomington: Indiana University Press. You must be a Rachel Tanur Memorial Prize applicant to submit an essay response.